I spend a lot of time on the trainer. 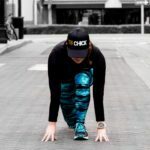 During peak training weeks I maxed out my trainer time at a little over 6 hours a week. Most of my summer cycling training was done on the trainer. I chose trainer rides for many reasons, convenience, the controllable environment and most of all, safety or rather fear. I’ve been buzzed and nearly hit a few times riding in my area and just didn’t feel comfortable riding outside for 3 plus hours at a time. There is a trail about an hour from my house that I love to ride, but most weeks I didn’t have the time to get out to it. I knew I needed to get a big ride in on the actual road, before my upcoming 70.3, so this last week I made it my mission to get out there. My road of choice was the American River Trail, the trail is long, smooth, beautiful and best of all car free. I traveled up there Saturday, but was only able to get about 24 miles done. 12 miles in my fiance broke his cleats and couldn’t clip in on the right side. We had to slowly make our way back to the car and buy some new cleats. I changed the long ride to Wednesday and decided I’d have to get it done locally. I just didn’t have the time to drive up to Sac again. We found a 12 mile loop of country roads to ride. The roads were definitely not optimal, cracks, pot holes and rough surfaces, but they were fairly empty and a good place for me to get comfortable. Below is a short list of a few things I learned during my ride. 1. How to drink at a decent pace – Before this ride, drinking on the bike required me to slow to 9-10 mph and coast as I struggled to get my bottle out, and take a few gulps. By the end of the ride, I was able to keep up my average pace, drink and put the bottle back. 2. Opening a bunch of packages, especially twist cap applesauce, on the bike is not easy. I’m so used to trainer riding where I can sit up, use both hands and don’t have to balance. Trying to open my applesauce, fruit snacks and ziplocked peanut butter and jelly were challenging. 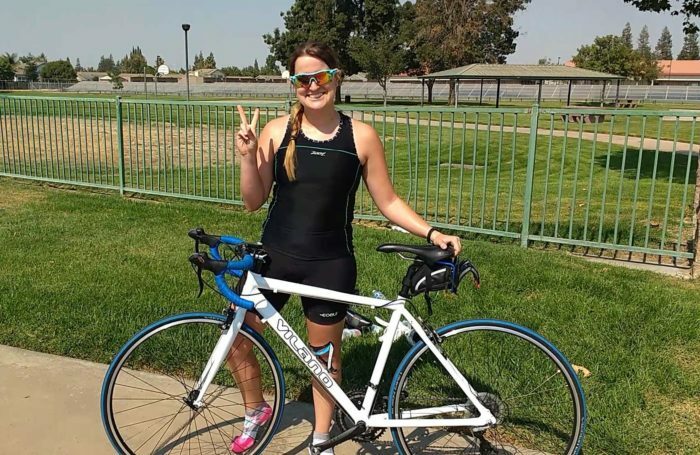 This ride allowed me to change my nutrition plan for my race. I’ll be eating the same things, but everything will be easy to get to. All of my fruit leathers, will be unpackaged. Yea they might get sticky, but I won’t have to wrestle with them or worry about trash. My applesauce pouches will be pre-opened and closed a little less snugly and my other snacks won’t all be ziplocked separately. Placing them in my bento box with a plastic liner will be good enough and reduce any struggle I may have during the race. 3. 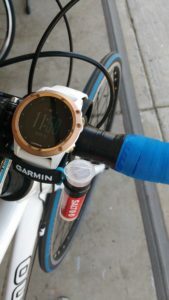 My idea to zip tie my base salt to my watch holder on my bike was AWESOME. During my American River ride I tried using my base salt and was constantly fumbling with it and nearly dropping it while taking it in and out of my bento box. I zip tied it to my watch holder on the bike and covered the zip tie in electrical tape to keep it secure. Now I just pop the cap and turn it upside down. Super easy and convenient. 4. Rough country roads are way harder to ride than the buttery smooth asphalt of city roads. I can average 16-18 mph on well paved roads. I’m no speed demon, but it’s a decent pace. On the country roads my average pace dropped to below 16. It was frustrating and a real leg burner at times, but reminded me that I should be training in all conditions, not just optimal. 5. How to corner “better.” I am terrible at cornering. Like truly awful. I slow to a turtle’s pace during tight turns. I know what I should be doing, but implementing it is another thing. Well 50 miles, helped with that. I’m not saying I’m amazing at it now, but at least my speed only drops a few mph instead of 6-7. Time in the saddle and really wanting to be done on the last loop helped with getting a better handle on my cornering skills. 6. Time on the trainer is no substitute for real time on the road. At the end of a trainer ride, my hip flexors are a little sore and that’s about it. At the end of my 50 mile ride, my neck and shoulders were sore, my quads were a little burned from the crappy roads and one of my hamstrings was tight. Things that never plague me during trainer rides and might not be as bad had I been riding out on the road more. If I could do it over again, I’d definitely up my outdoor riding to at least once every other week, if not once a week. 7. Bugs taste terrible! Okay I already knew this one, but I did accidentally eat a bug or two mouth breathing, lol. 8. Riding outside is FUN, goes by way faster and is considerably less sweaty than the trainer. Nothing beats feeling the wind against your face as cruise down the road or talking up the same group of horses and cows 4 times as you pass them. Checking out the crops you didn’t know were grown locally and enjoying the sunshine on your back. After my race and for my full next year, I will definitely be increasing my outdoor riding. I still love my trainer, but there is no substitute for riding outdoors. Vineman has just under 4000 feet of climbing so I really can’t avoid it anyway. Time for me to eat some hills.